Medi-First Antiseptic Wipes XL - 20 Count. Individual towelettes saturated in a solution of Benzalkonium Chloride. The XL size makes them perfect for cleaning up minor wounds. 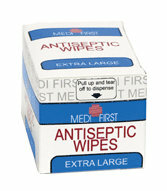 Medi-First Antiseptic Wipes XL -20 count. Individual towelettes saturated in a solution of Benzalkonium Chloride. XL size for cleaning up minor wounds.